Protesters pose outside Virgin Care HQ in London with a banner ‘do Virgin Care’ calling for an end to private companies using the NHS logo and for Virgin to stop avoiding tax. 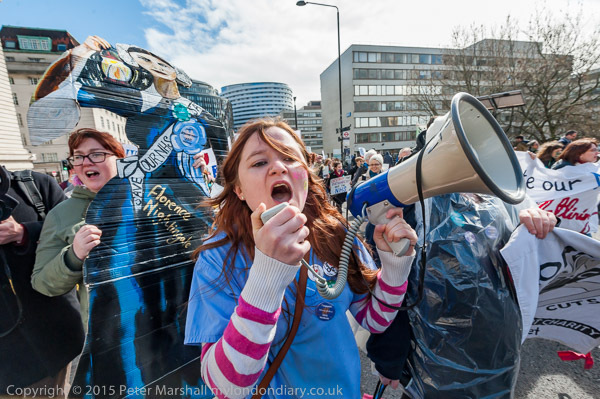 “The Great NHS Heist” – SELL OFF II. A Documentary Film. The NHS has been quietly transformed from a public health system designed to deliver health care to everyone based on need in the most cost efficient manner, to one designed to maximise profit extraction by global private health insurance giants. Achieved by means collecting premiums from the insured then denying them care when they become too sick and expensive whilst excluding the unprofitable, poor and the elderly. Switching to this model, based on the American system, amounts to one of the greatest betrayals of the public interest by successive Governments, Conservative and New Labour. The stealth privatisation has seen our hospitals turned into distinct business entities and different parts of the NHS separated out and compelled to compete with each other rather than collaborate together for the interest of the sick. Consequently we have seen the erosion of staff morale and abandonment of the ethos of the NHS whilst simultaneously diverting billions into administration and bureaucracy only needed to run a commercialised profit driven system. The deliberately complex and stealthy deception has taken three decades yet most people remain unaware of what is afoot. Mainstream media have neglected their role in holding our politicians to account, and explaining to the public what is going on with their beloved public service. We are trying to fill this void. Our film “Sell Off” demystified the marketisation and fragmentation of the NHS and showed how it has been set up to fail using Private Finance Initiatives, complex funding arrangements and structures which help paint the NHS as financially failing, which of course is the intention. Debts, fragmentation, cuts and closures have left the NHS on it’s knees as we enter the final stage. Staff culls, increasing use of temporary agency staff, degrading of training infrastructure and eroding employment rights prior to corporate takeover. A failing NHS now labelled ‘unsustainable’ and made vulnerable but to be rescued by patient charges and top-up insurance to be administered by our American friends lying in wait for the big bonanza. Services delivered by for profit companies hiding behind the NHS logo. With “The Great NHS Heist” we hope expose and explain the big picture and leave the viewer in no doubt as to the end game. Contributions from front line staff, whistleblowers, British and American policy experts with experience of the dysfunctional system we are importing. The film will provide a complete account of the best kept secret in recent British domestic politics. It’s then over to you, the public to spread the word and force our politicians to reverse the destruction and protect our NHS from the corporate raiders before it’s too late.